How can you be sure the programs you create will resonate with your intended audiences? As youth educators, we turn straight to the source to answer that question: our students. Youth interns push us to think more deeply about our practice and pedagogy, and, in turn, engaging them in program development and implementation immerse our students in the real-world impact of our institutional missions. 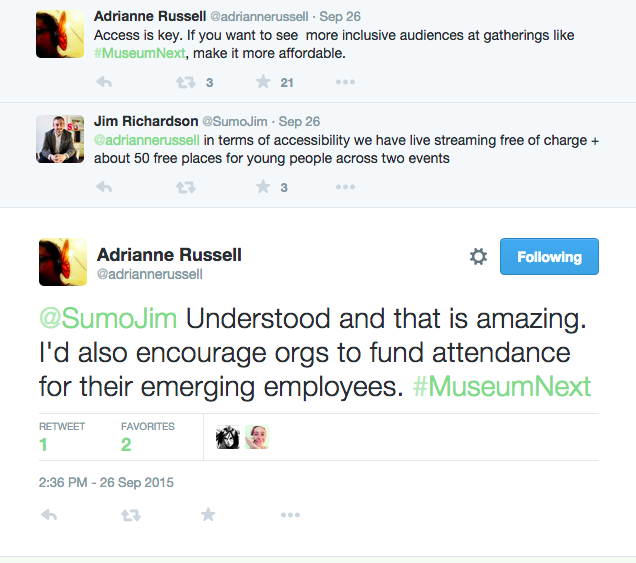 To this end, in May 2016, Park Avenue Armory Youth Corps joined forces with youth interns from the Museum of Modern Art and the American Museum of Natural History to present a panel session at the annual NYCMER (New York City Museum Educators Roundtable) Conference, encouraging hundreds of attending educators to consider how they, too, might view their own constituents as experts. Dovetailing with recent posts on Art Museum Teaching proposing that museums commit to being spaces for dialogue and conversation, we share the reflections of Park Avenue Armory Youth Corps members Nancy and Terrelle below to inspire you to explore how you might turn to your own students and visitors to take the first steps towards empathy: listening deeply and with care to what our audiences need and want from our institutions. We send our greatest thanks to fellow youth panelists Cara and Yvonne from MoMA and Roman and Karina from AMNH, as well as to staff facilitators Calder Zwicky (MoMA) and Barry Joseph (AMNH), for collaborating with us on this session! Nancy: The conference was a total success. Terrelle and I were excited for the meeting from the very start, and we were ready to introduce the Armory and all it has to offer to us, as well as the Youth Corps program, to the people attending the conference. Terrelle: Being part of the conference was a really great experience for me. It really gave me more insight about other youth internship programs in NYC, and made me appreciate working at Park Avenue Armory so much more. Nancy: We were part of a panel called “Ask the Experts: Activating Your Museum through a Younger Lens,” with other youth interns from the American Museum of Natural History and MoMA. We got to chat with them beforehand at a nearby Starbucks and know more about what their programs had to offer. Once we were inside the Morgan Library and Museum, where the conference was taking place, we began introducing ourselves to the educators attending our session, and all our nerves went away. Terrelle: The first question we were asked was how we want to be identified—as teens or youth or something else? This question is quite tricky since it really depends on the type of programs and the type of people you want to reach. I have seen a majority say they would prefer the term “youth” as it is less patronizing than the word teen. To me, “teen” typically refers to ages 12-15. Nancy: Also, at our program here at Park Avenue Armory, the age ranges from 13-22+, so “teens” wouldn’t exactly be the way to go. Instead “youth” can mean any age within that spectrum. Terrelle: Others in our panel found “teen” to be better, and others thought whatever term makes alliteration with your program title, then that’s what you should use. Words like Student and Young Artist were also mentioned, and I liked those as well, because in a sense everyone is a student. Everyone is still learning, especially when it comes to art—there is always something you can improve on. Speaking of improving, another question asked that stuck out for me was: “How do your programs provide space for failure?” Here at the Armory, we create a final project every semester that is inspired by a production—past projects have been guides to unplugging, an audio walk, and installation art. We typically go through a tinkering phase where we experiment with different materials, different ideas, and produce different outcomes. Our tinkering process is our trial and error phase. Many people know the saying “You learn from your mistakes.” When you fail at something, it’s not that you should give up—it’s for you to analyze what you did wrong and to fix it. Once you learn what you need to do to have your envisioned outcome, then you can adjust. Nancy: We were also asked whether or not we felt we had a voice within our programs. This was an automatic no brainer for me since that is exactly what the Armory provides, especially with the Advisory Board, which enables us to make vital decisions for events, productions, and our program. Terrelle: I am one who always vouches for programs to let youth have a voice when it comes to something that they’re involved in. If something is for teens/youth, then they should be able to give you feedback on how you can run it better or improve on certain things. Having end of semester feedback/questionnaires or advisory boards become essential, because this gives your students a chance to voice their ideas and concerns. Nancy: We also got asked if we felt that the programs we are in represent the diversity of New York City. This made me think of the different schools the Armory partners with, which have ethnicities from all over, and many are international students. The different boroughs that we come from add to the diversity that our program has. Terrelle: All in all the NYCMER conference has definitely inspired me—to work on my networking skills, one of my many personal goals for this year, and also to become more involved in youth events and teen nights in the city. Nancy: Representing the Armory was not only fun but interesting. It was great to be able to learn about other programs that aren’t our own and meet other students who work in cultural institutions. We were glad to have been able to provide answers to arts educators! We invite you to learn more about the Armory Youth Corps here, the MoMA Teens program here, and the American Museum of Natural History teen programs here. Header Photo: After a successful session, the youth panelists pose in the Morgan Library and Museum. Photo by Barry Joseph. Reposted from Art History Teaching Resources (AHTR), a peer-populated platform for art history teachers & home to a collectively authored online repository of art history teaching content including lesson plans, video introductions to museums, book reviews, image clusters, and classroom and museum activities. It was five years ago, in 2011, that Karen Shelby and I sat across from each other in an office at Baruch College, CUNY, and bemoaned the lack of a peer group where we could share thoughts, ideas, concerns, and peer support around pedagogy in Art History. I was a Graduate Teaching Fellow in my first semester of U.S. classroom teaching, and Karen was a pretty new Assistant Professor who had just won a Whiting Award for her great work as an instructor. We both loved what we did, and from these shared conversations was born Art History Teaching Resources (AHTR), a genesis I’ve written about plenty before in places like Art21 (here and here). During those early conversations, I explained to Karen how the place I had come from before my dive back into graduate school–four years as a staff member and educator at the Guggenheim Museum–had been a very different teaching experience. At the museum, we had weekly teaching workshops; we had peer discussions; we traded lesson plans; we helped each other devise tour routes and open ended questions; we talked about data-driven assessment of our work (that was the moment in which a truly awesome educator and colleague, Rebecca Herz, led a team at the museum ina pioneering study of literacy in the arts). We also had mentorship (and I still count Ryan Hill among my very best mentors–and not only because he introduced me to my husband!). In short, we had a rich and vibrant community where teaching was valued by those we worked alongside (though don’t get me started on departmental hierarchies in museums that routinely dismiss the work of Education as secondary to Curatorial…). Karen and I decided we needed this within the academy, and we began to build it by launching AHTR. When we realized it would be greatly enriched by partners who had strengths we didn’t, we were incredibly lucky to welcome Parme Giuntini, Nara Hohensee, Renee McGarry, Ginger Spivey, and Kathy Wentrack, and this is the core team who lead AHTR today, along with advisors and mentors for whom we’re truly thankful. What you do in a museum (and outside of a museum if you want to share):In Museums: Assistant Director, Learning and Artists Initiatives @MoMA, which means I collaborate with artists to develop public engagement experiences for museum audiences and run a robust learning programs for adults (50-60 programs/year). Outside of museums: I curate the conversation series a annual conference on social practice called Open Engagement, which took place in Oakland in 2016. I’m also co-authoring a report for the Art + Feminism wikipedi-athon group on recommendations for best practices for inclusion and diversity for their events and resources. I am an artist too. What you do in a museum (and outside of a museum if you want to share):I am currently Director of Education & Public Programs at the Portland Art Museum, where I have the privilege of working with an incredible team to build connections with our community in meaningful and relevant ways. This position allows me to work across program areas, think creatively about audience and public engagement, and advance ways to bring community voices into the fabric of our institution and its collections & exhibitions. Outside of the museum, I enjoy being outdoors here in the gorgeous Pacific Northwest, hiking or camping with my family as much as possible. 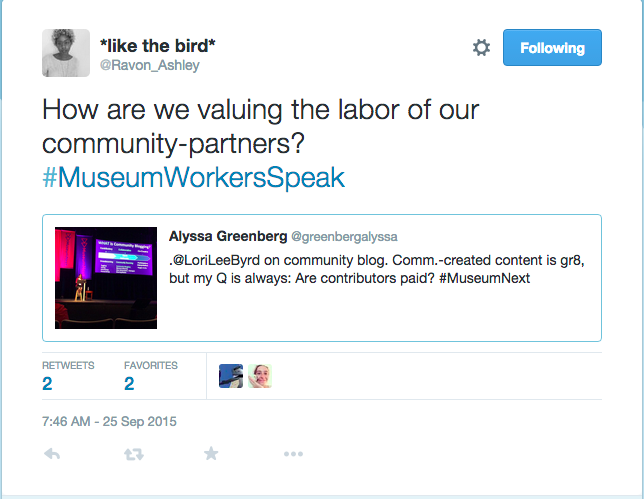 What is your resource?Art Museum Teaching: A forum for reflecting on practice. 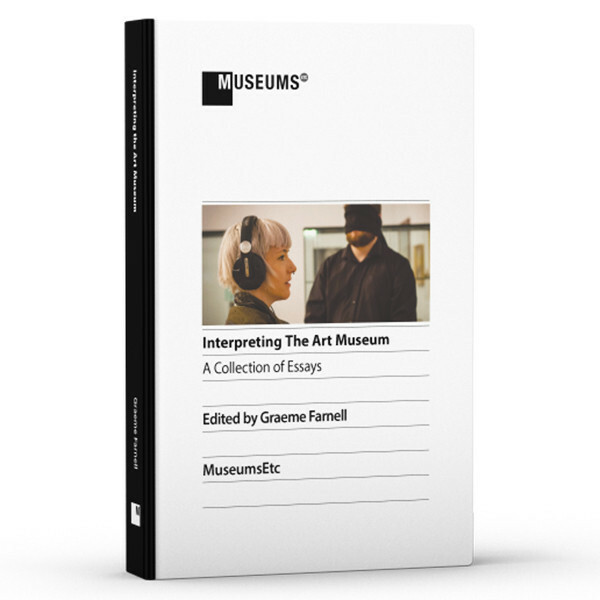 This essay is part of the new MuseumsEtc book Interpreting the Art Museum, an expansive volume of 19 essays & case studies from experienced museum professionals sharing some of today’s most successful initiatives in art interpretation. From November 2014 through April 2015, the Portland Art Museum hosted the installation of a complex, unsettling, and physically-immersive multimedia installation piece entitled The Enclave (2013) by Irish contemporary artist and photographer Richard Mosse. Consisting of six monumental double-sided screens installed in a darkened gallery, paired with a powerfully haunting soundscape, The Enclave presented a unique challenge for the Portland Art Museum’s education team as they tackled issues of interpretation, visitor reflection, and public learning. Given these expectations for ambiguity and complexity, the museum’s education team decided to construct an extended series of meaningful opportunities for visitors and staff alike to respond to and react with the installation. These opportunities encouraged personal reflection and physical engagement within the space of The Enclave and provided open pathways for further learning. Opportunities offered incorporated a range in levels of engagement from which to choose. Tumblr site (http://portlandartmuseum.tumblr.com) on which the museum regularly posted visitor responses to The Enclave. While these interpretive strategies serve as the focus for this case study, the museum also partnered with the locally-based international development non-profit organization, Mercy Corps and the Mercy Corps Action Center, whose staff facilitated workshops for museum staff and docents as well as teachers and students participating in a joint school program between the museum and Mercy Corps. In addition, the museum hosted an extensive series of public workshops and conversations which specifically encouraged open dialogue and personal reflections paired with viewing The Enclave. Throughout these interpretive strategies, our goals were to allow for open, personal, even emotional responses to the piece; to encourage visitors to physically engage with the space of the piece; and to provide pathways for further learning, especially related to the situation in the DRC. Early in the education team’s thinking about how to facilitate visitor experience with The Enclave, it became clear that visitors walking out of the installation would need a way to work through their reactions and responses. In the absence of a tour or multimedia guide, it would fall on the content of the interpretive space to empower individuals to tackle The Enclave independently. Simply entitled Reflecting on The Enclave, the in-gallery interpretation space helped visitors transition from a state of being acted upon by the exhibition’s visual and auditory forces to having the freedom and quiet to react to what had just transpired. 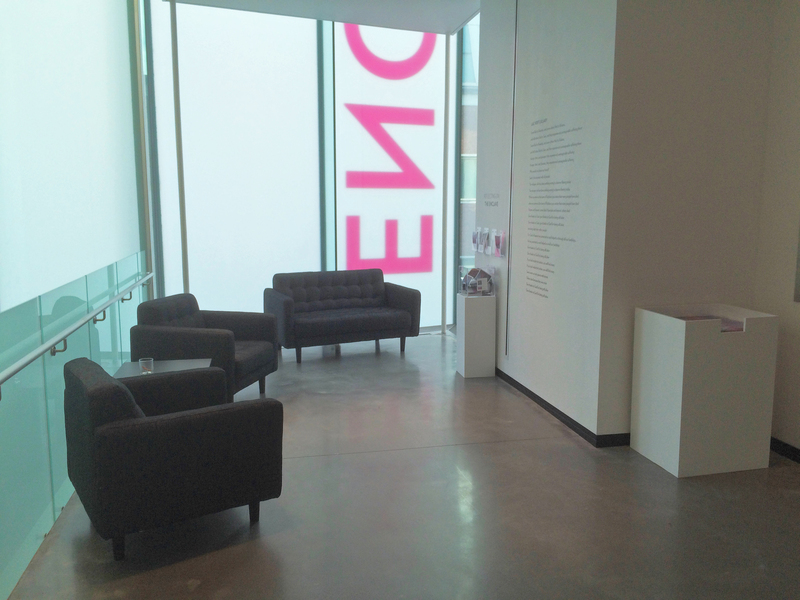 The space did not provide visitors with the museum’s point of view or any curatorial voice. The museum remained silent and instead provided a comfortable space for visitors to have and share their own perspectives. This small “living room” space included a love seat, cushioned armchairs, and a small end table with a bin of pencils. Housed across from the seating area were five clear acrylic holders, each of which held one deck of interpretive postcards. The front side of each card displayed a still photograph from the exhibition and the backside displayed the interpretive prompts: I saw… I heard… I felt… Five cards were placed in the rack with the photograph facing forward and one card was placed in the rack with the interpretive prompts facing forward. This arrangement indicated to visitors the card’s multi-interpretive purpose. Sitting on a pedestal directly below the cards was a clear acrylic box with a slit in the lid. Cards filled out by visitors could be seen inside the box. The nature and placement of these items invited visitors to look at, pick up, write on, and add a card to those already in the box. Attached to the side of the box was a sign inviting visitors to See what others have shared via the project’s associated Tumblr site. This information indicated to visitors that they could read others’ responses and that their responses were aggregated into an ongoing community commentary about The Enclave extending beyond the museum. Knowing from previous experience that cards are popular takeaways for visitors, these postcards aimed to provide visitors with an opportunity to say I saw this or I witnessed that. Therein lay one of the project’s most significant challenges. With six simultaneous screens and a 47-minute runtime, visitors emerged from The Enclave having witnessed entirely different scenarios. Some saw rolling images of stunningly beautiful landscapes. Others witnessed a funeral scene juxtaposed with a dangerous birth. A body abandoned in the grass. A sprawling internal displacement camp. Our challenge was to find the emotional or thematic touch points that could translate this immersive experience into static interpretive cards. Our interpretive media team segmented the piece into major themes or experiences: war and conflict, the role of the photographer, nature and the sublime, Africa and the other. Cross-referencing this list with the potential photographs approved by the artist’s gallery, we chose six images that we believed could serve as touchpoints for a range of potential experiences: a sublime landscape, a military roadblock, a group of civilians, an individual soldier, a young woman, and a damaged village. We deliberately selected images that were highly polysemic. For example, the landscape Platon echoed picturesque tropes of art history. It also could speak to environmentalism, highlight the surreal nature of the pink film stock, represent the work’s otherworldliness, or, as we saw in the response cards, embody an idea of hope. By contrast, we did not select a photograph called Madonna and Child, which featured a uniformed soldier holding a baby in the pose of the Virgin and Child. This image, while incisively poignant in highlighting the complexities of villain and victim, left little space in which the visitor could create meaning. By offering the visitor a broad range of photographs, we invited them to self-select the image that matched their experience. 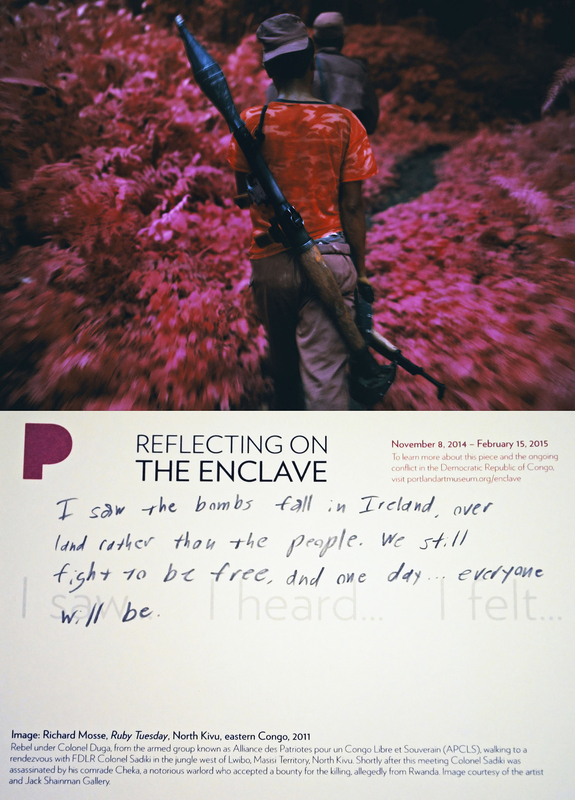 Sample visitor response card from the Reflecting on The Enclave interpretation space, Portland Art Museum. Initially, we had planned to further draw out these themes through a variety of questions printed on the verso of the cards: Who is the victim and who is the villain? What is the man on the right thinking? What about the man on the left? Due to a compressed project timeline, our initial prompts were developed without the benefit of visitor testing. Therefore we used a docent training session as an ad hoc focus group. After standing in The Enclave ourselves and observing docent educators processing their experience, we redeveloped the prompts entirely into the three, simple, sensory-based statements: I saw… I heard… I felt… These words, which were repeated over and over in the training session, were familiar to us from educational research, particularly Harvard’s Project Zero Thinking Routines, which employed them. They provided enough guidance to bolster processing and reflection, but to still afford room for a variety of responses and types of meaning making. Moreover, by splitting the prompts into bite-sized statements, we also hinted to visitors that it was OK to have a range of responses from simple to complex, and to navigate the space on the reverse of the card in whatever way they chose. Lists: Some visitors took the prompt literally, charting what they saw, heard, and felt. They wrote in vertical columns over the words, sometimes even using lines to divide their cards into three spaces. They outlined and circled the light grey text to emphasize it. They drew lines between the printed words and their handwritten texts. Notes to the museum: Often marked with explicit salutations to the museum or the artist, visitors used these cards to give us feedback in the form of concerns, thank you notes, and a frequent request to turn down the volume (the artist preferred the audio component of the piece to be quite loud, providing a physical experience of sound as well as of the projections). Cynicism and despair: Although there were uplifting moments in The Enclave, the artist did not shy away from depicting violence, destruction, and conflict. This response was almost a direct inverse of those in the first category. Intellectual connections: These visitors related The Enclave to their prior knowledge of politics, literature, and film, bringing in comparisons to Kubrick, Heart of Darkness, Invisible Children, and others. As we know, adults learn by relating new ideas to their existing matrices of knowledge and experience. In this way, we saw them working through The Enclave, demonstrating learning and engagement as well as an interest in thematically related topics. Self-absorbed artists: Many visitors attacked the piece, challenging the validity and morality of a white artist receiving accolades and making money by speaking for black communities and “capturing” images of black bodies. Descriptive processing: Many visitors did not attempt to reach conclusions. They listed what they saw, heard, and felt, sometimes filling the entire card just with descriptive words. 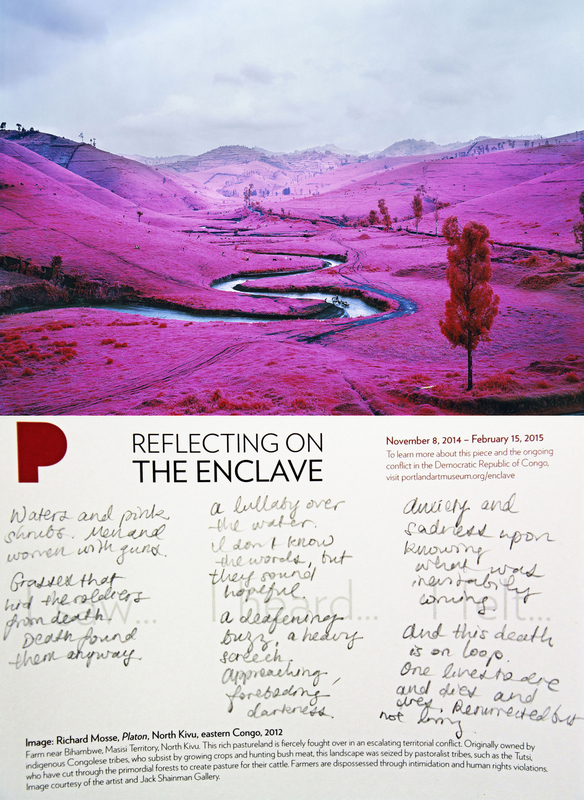 While The Enclave is on view at the Portland Art Museum, visitors are invited to reflect upon this immersive experience and share their thoughts with the museum. These are some of their thoughts. Framed in this way, the site offered visitors validation. The museum posted, without comment or hierarchy, every type of response: those who called out Richard Mosse as a “selfabsorbed artist”; those who wrote only one or two words; and those who made spelling or grammatical errors. Viewed together, the stream emphasizes that there is no single interpretation or meaning for this work and that, in the museum’s eyes, no one viewer’s voice is more important or correct than the others’. The people in this area of the continent are guided by superstition fed by rage and terror. No education or very little. No chance, no changes, no hope – only renewed conflict + murder. Overall, however, we had only one card that we chose not to share because of its references to suicide. In five months, our Tumblr site received a little over 1,000 page views: 10% of visitors viewed between ten and twenty response cards in a visit; 5% viewed between 30 and 40; 30% returned to the site at least once and 180 began following the museum on Tumblr. Even months after the exhibition has closed, we still gain new followers and see new reposts. Perhaps most interestingly, however, is the fact that no one card has emerged as the most shared or iconic image from the project. Although a few Tumblr users reblogged a batch of cards at once, most chose one or two, frequently non-sequential cards, to share with their followers. As virtual visitors, they selected from the diversity of responses offered, to find the few that resonated with them as individuals. As contemporary art continues to challenge museum visitors in a variety of ways, it is important for museums to carefully reflect on the ways in which visitors will experience and respond to unsettling, immersive, complex, and socially-relevant works of art. In our experiences with The Enclave, having a set of interpretive strategies that allowed for individualized reflection as well as collective sharing allowed for a more meaningful experience for many visitors. The opportunities for personal reflection and extended learning offered by the museum for The Enclave have helped to anchor the museum as a museum of its place, not just a museum in its place – and these experiences might provide guidance to other museums as they plan interpretation around similarly complex contemporary art. This essay was republished with the permission of MuseumsEtc, and you can download a free PDF of this essay directly from their website. If you enjoy this essay, check out 18 more in-depth case studies in art museum interpretation that are part of the new volume Interpreting the Art Museum. Check out the entire catalog of museum publications available from MuseumsEtc. KRISTIN BAYANS: Interpretive Media Specialist at the Portland Art Museum, where she works cross-departmentally to create mobile, web, and in-gallery learning experiences for special exhibitions, the museum’s permanent collection, and the Object Stories project. Previously, Kristin served as Senior Educator in the Oregon Museum of Science and Industry’s Vernier Technology Lab and as an Assistant Educator for the Smithsonian’s Mobile Learning Institute. She holds an MA in Museum Studies from George Washington University and an MA in Art History from the Courtauld Institute of Art. MIKE MURAWSKI: Director of Education & Public Programs, Portland Art Museum. Murawski earned his MA and PhD in Education from American University in Washington, DC, focusing his research on educational theory and interdisciplinary learning in the arts. Prior to his position at the Portland Art Museum, he served as Director of School Services at the Saint Louis Art Museum as well as head of education and public programs at the Mildred Lane Kemper Art Museum at Washington University. PHILLIPPA PITTS: Associate Educator for Gallery Learning at the Portland Museum of Art in Portland, Maine, where she oversees interpretive media, adult learning, and participatory gallery spaces. Prior to this position in Maine, Phillippa served as the Kress Interpretive Fellow at the Portland Art Museum in Oregon, Lecturer and Gallery Instructor at the Museum of Fine Arts Boston, and built apps and games in museums around the country. Phillippa holds an MA in Art History and Museum Studies from Tufts University. On October 16th, Museum Mashup, Triad Style took place at the Southeastern Center for Contemporary Art. Individuals from all over the state came to experiment and meet new friends, all with the idea of experimenting with cultural experiences. As this is at least the 7th experimental museum teaching event like this in the past year or so (they have happened in New York, Brooklyn, San Diego, New Orleans, Cleveland, Denver, and now Winston-Salem), I wanted to share more on how to plan your own Museum Mashup, as well as some reflections from our recent SECCA Mashup. The impetus behind this is simple: empowerment and ownership. People on Twitter (encouragingly using #MuseumEdMashUp tag) reached out to me asking if they could do a Mashup and/or I or someone from my organization could come out and lead one at their museum. People here were asking if they could come since they weren’t an educator and others asked if they could invite non-art educators. My answer is and always will be yes. Yes, invite non-art educators. Yes, come even if you are scared. Yes, do one anywhere and everywhere. Yes. Which leads to the thought that this isn’t so much of a ‘How-to’ as a ‘How-we’. And if we keep sharing this ‘How-we’ then we, as a community, can use this experimentation in the best possible way for ourselves. Found a group of people. As some of you may know, I just moved from NYC to Winston Salem, NC. I knew a handful of people, museum people mostly, through traveling and my partner. After chatting with Debbie Randolph of the Southeastern Center for Contemporary Art, who was part of the NOLA NAEA Mashup at the Ogden, I emailed a group of people I knew in the Triad museum world and told them about the idea. I asked them to ask people they knew, and we had a group. Found a place and date. Lucky for us, Debbie had done the Mashup in NOLA and knew how successful it could be. She offered to host the first at SECCA. As a group, we did a Doodle poll and found a date and time frame that worked for the majority. Yep, promotions before logistics. Since the basic idea was experimentation, and because I had done a Mashup before, I wrote a quick blurb and put up a Facebook Event. The Engaging Educator wrote a press release and shared it with SECCA’s Marketing Director, who shared it with their press contacts. The Schedule: Mashups are fast. There was 15 minutes alloted for greetings, groupings and a quick warm-up, about 35-45 minutes for the participants to create a 5-7 minute experience, and then the time for the experiences. That last time frame is flexible, based on the number of participants. 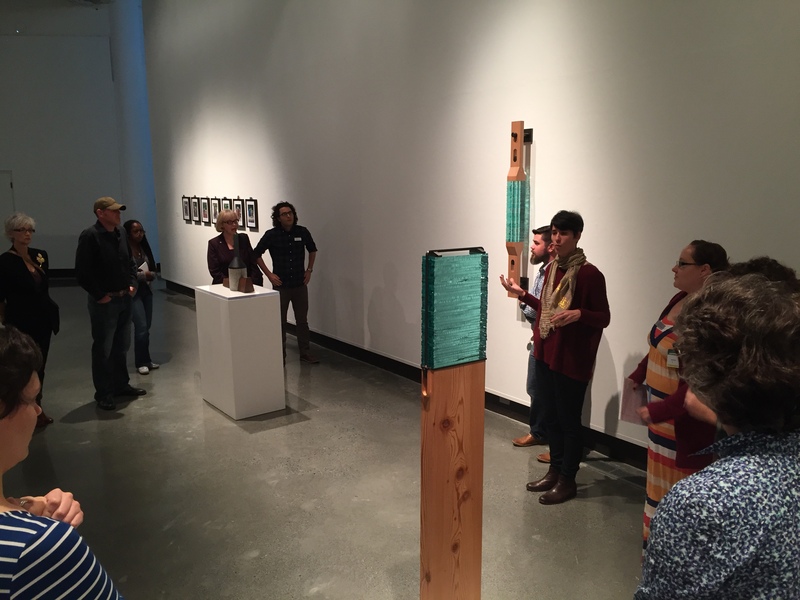 The Works: Since the exhibition at SECCA, Point & Counterpoint has 18 artists on display, it was natural to use them all, since we didn’t know exactly how many people would be attending. Alex Brown from SECCA printed out cards with the artist names, and the groups would randomly choose which artist they would be working with. Some artists had multiple works, but ultimately it was up to the group to decide what they wanted to create. The Groups: As people walked in, they signed in. Taking the total number and dividing by three people per group, people were assigned into six groups in the good old fashioned method of ‘1, 2, 3, 4, 5, 6…1, 2, 3, 4, 5, 6…ok all the 1’s over here, the 2’s over there.’ I ended up doing this in a notebook and just calling out each group, but that elementary school grouping happened in a tiny moleskin. Facilitation: The facilitator is crucial, but the lack of facilitator voice is even more important – it isn’t their show. Debbie introduced SECCA and the exhibition, and I explained the Mashup goals – random groups would randomly be assigned a work, they would have a finite amount of time to create an experience with the work. This experience would have to be experimental – that is, no VTS, inquiry, traditional teaching styles, and ideally something that could fail. Aside from instructions, the facilitator needs to push the event along, but not comment. While I did lead the group in an improv warmup (everyone felt scared! I feel energies too often in rooms, so I had to fix it! ), I timed groups, cut them off when they went over time, and turned the attention over to the next group. On a personal note, I leave things vague and don’t like to give the group ideas, suggestions, props – I want them to define experience themselves, the interpretation to come organically and the experience to be group driven, not agenda driven. Yes, I would love to see everyone do crazy out there experiences – but risk to me is very different than risk to others. Lunch: Lunch was provided for the participants. This is optional, clearly, and our next one (YES, we have another planned!) will happen after lunch. I’m a fan of giving people some kind of treat after positive-risk taking. Reflection: They came, they created, they presented, they ate, and they reflected. Below, you can read the reflections of several participants – I left it optional to submit a written reflection, but post-lunch we chatted about a few key things. I asked the group to think about how they felt before, during and after the Mashup, what successes and failures they saw and had, and what can they do today, tomorrow or eventually with what they saw today. Those questions were also posed to the group for the written response. Because that’s exactly what we are doing. This wasn’t my first Mash Up, but this might have been my favorite one, only because of the domino effect that happened after. People are excited – we had educators, but we also had a curator, a chef, an owner of a new makerspace, artists, retired teachers, a poet – and that energy around connecting with objects and works is incredible. So YES, do these all over…AND share what happened! Before the Mashup at SECCA, I was feeling slightly anxious. I had seen a mash-up in New Orleans, but wasn’t exactly excited about doing it myself. What if I didn’t have any ideas? What if I let my group down? What if I was assigned some artwork that I couldn’t find a connection with? I felt better knowing that I wasn’t going into it alone and that everyone would be encountering their assignment at the same time. Mostly before the mash-up I was feeling reluctant to go and trying to make an attitude adjustment so that even if I didn’t have fun, I wouldn’t bring an attitude that would encumber anyone else from having a great time. Appropriately, Jen rounded up the group for a collective experience to get us started. This was crucial, as warm ups can be. I knew most of the people there, but there were some I didn’t and it was not a gathering that had existed before. We needed a shared experience before beginning the task. Simply gathering in a circle helped, Zip-Zap-Zop further supported a new dynamic and preparation for us to move forward. I felt better when assigned my group; I’ve been on a committee with Katherine for the better part of this year and I had met Emily before at other museum educators events. When we received our artwork, I felt a little anxious again: it was a video work. How would we incorporate a piece of art that was so dependent on time? When we went to the video, however, I began to relax again. It was beautiful. My fear of connecting with the work was quickly assuaged and the next challenge was to figure out how to create a corporate experience. I felt blank. What on earth would we do? When Emily suggested sharing our thoughts in flashes while we watched, I again felt better and knew I could trust the process. We were sharing ideas; we had similar observations and some of the same ideas were resonating with us. The film was short and looped through several times as we formulated our own responses and began to brainstorm our approach. I kept finding myself thinking, what do I want people to notice and learn and had to remind myself I wasn’t teaching. Our goal was to create an experience. When watching the film that showed falcons and Arabian desert, I felt compelled to move. And movement became part of the experience. We worked together to create an experience; while we didn’t require our visitors to look closely at the video or experience it in full, we did use the elements of the video to inform the experience. And, it served as a backdrop, visual and auditory, as we proceeded. I hope that people were able to see it and make connections while participating in the activity we led, even if the connection to the art was necessarily soft. There was a moment, as we wrapped up our “experience,” when I realized that everyone in the gallery had jumped right in and trusted us all the way through the activity. They trusted us and each other (it might have helped that the room was darkened for video) such that at the end we were all standing as falcons and emitting a piercing cry of a bird of prey into the gallery. I was grateful for their trust in us and I think they were rewarded for it; the positive energy in the room was palpable. I left the day feeling energized and like I had had a good mental/professional workout. While in some ways, I feel like I am constantly experimenting in my own teaching in the process of figure out what works, I also experience limitations. Some of these are institutional, some are self-imposed. What I saw from my group’s gallery experience is how movement can be a really important thing to do in an art museum. It helped me respond to the video and it further shifted the energy of the collective group. I can thus push more to incorporate movement in the context of my museum teaching–trying to find ways to do it safely and structure experiences so that it is included. In terms of structure, I think it was great to have the length of time (5-7 minutes) that we had and the number in each group (3). Also, as one of my colleagues said, it’s so fun to get to work with other people’s art! The Museum Mashup is a really fun and fresh way to connect with one’s creative side and to collaborate with museum and art professionals. Mediation is the sacred key to what Curators and Educators do–it’s our shared ground. The Mashup brought us together and helped bring about a variety of responses, approaches to mediation, and conversation showing that good things happen when you play. When I first signed up for the Museum Mash-up I really had no idea what to expect, but I had met Jen a week or two before and I knew that it would be an exciting event. I met some interesting new people, which is rare for me. I know everyone in town! I was surprised by how some of the groups gave me a new and very interesting way to view some of the art installations. I think I made some new friends at the Mash-up, and I plan to take a closer look at the exhibits at SECCA and explore some new perspectives. It’s not always easy to break away from what “works”, but I believe it is always worthwhile to step back and look at things in new ways and through different perspectives. By encouraging collaboration between educators and non-educators from the Triad, the Museum Ed Mashup at SECCA gave me the opportunity to play with a group of individuals that value experimentation and play as much as I do. In the field of museum education it is often all too easy to stop experimenting and become complacent when you find something that “works” well enough. This could be a tour program, an art activity, a scripted speech, or a way of looking at or experiencing artwork. While there is nothing inherently wrong with repeating programs or experiences, repetition in isolation and without experimentation can lead to complacency, and ultimately stagnation. 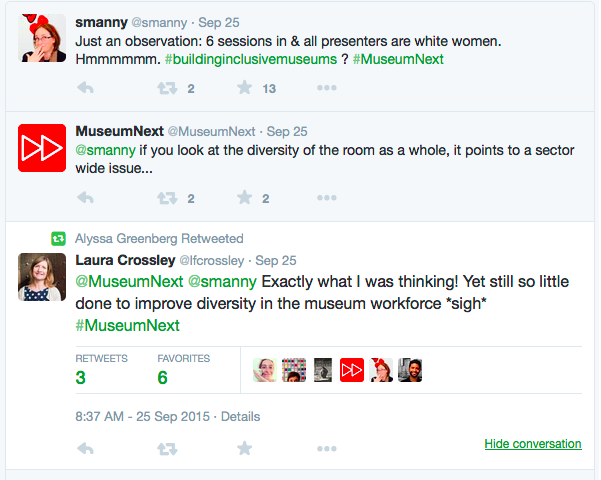 This problem is exactly what the Museum Ed Mashup was created to combat. And that is exactly what it did. By bringing together educators and non-educators together from varied backgrounds it gave everyone the ability to experiment freely and experience the world through different perspectives. This, I think, is the greatest gift the Mashup has to offer. It reminds us that not everyone thinks alike. The time spent at MuseumEd Mashup, far exceeded my expectations. In a world of meetings, planning, lectures and programming, it was refreshing to step away and look at exhibits in a more provocative way. I was inspired to explore the artist and medium in new and creative ways, with others! Thank you for stepping outside of the box and taking risks with your audience. 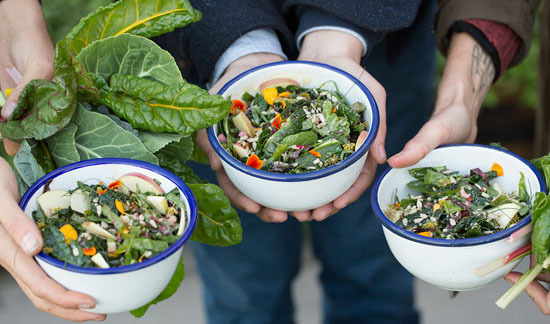 What is the Getty Salad Garden? Starting this October, the Getty Salad Garden, an installation of organic heirloom vegetables and salad greens growing in raised beds, pops up on the Getty Center grounds as the fascinating history of art and food come together in two special exhibitions: The Edible Monument: The Art of Food for Festivals, and Eat, Drink, and Be Merry: Food in the Middle Ages and Renaissance. Reposted from the Getty Museum’s website and The Getty Iris online magazine. Special thanks to Sarah Cooper and Annelisa Stephan at the Getty, as well as artist Julia Sherman, for allowing me to repost this content about such an inspiring, creative, and experimental project. Presented by artist and writer Julia Sherman, creator of the popular blog Salad for President, the Getty Salad Garden is conceived as a dynamic platform for conversations, drawing together a wide variety of creative voices. 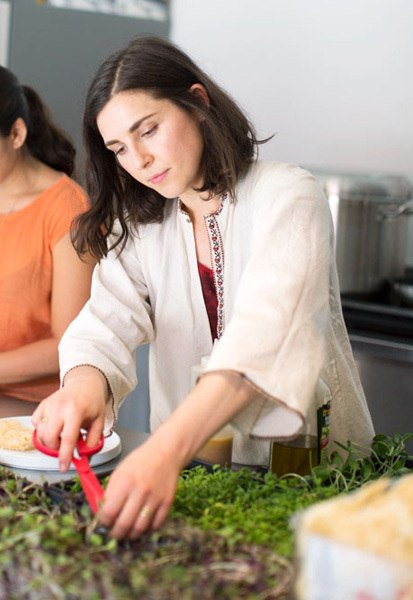 Like the format of her blog, Sherman will invite a range of artists and creative guests to join her in harvesting and making salads, emphasizing that the simple act of cooking together can be the catalyst for fascinating conversations and a fruitful creative exchange. Through sharing their artistic and culinary interests and the surprising ways they intersect, the conversations reveal the potential for a simple salad to invigorate our creative lives. Throughout the fall, the Getty Salad Garden will serve as an unexpected, playful space for investigations into the historical material on display in the galleries, infusing it with contemporary perspectives. 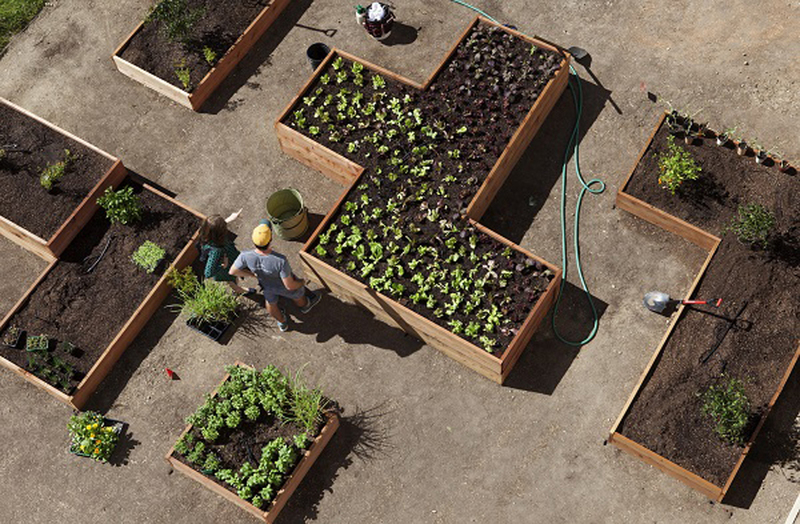 For the project, Sherman collaborated with urban gardeners Farmscape Gardens, and art-historian-turned-landscape-architect David Godshall of Terremoto Landscape. 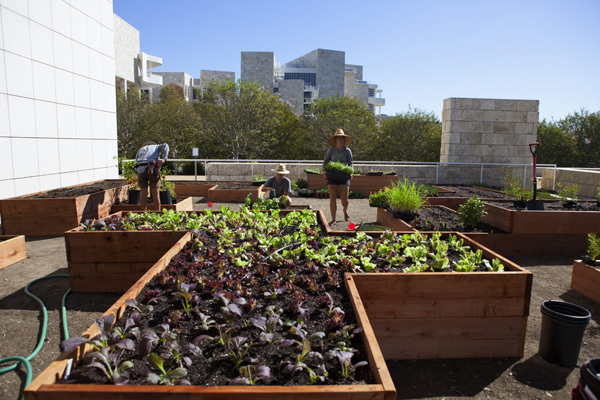 Together they have designed a garden which thoughtfully responds to the Getty Center’s architecture and landscape, and utilizes rare seeds, including 19th-century varietals, that help preserve agricultural and culinary heritage. The garden will be drip-irrigated, using dramatically less water than a lawn requires. The Getty Salad Garden will support a variety of projects documenting the salads and conversations Sherman has with exciting members of Los Angeles’s artistic community. 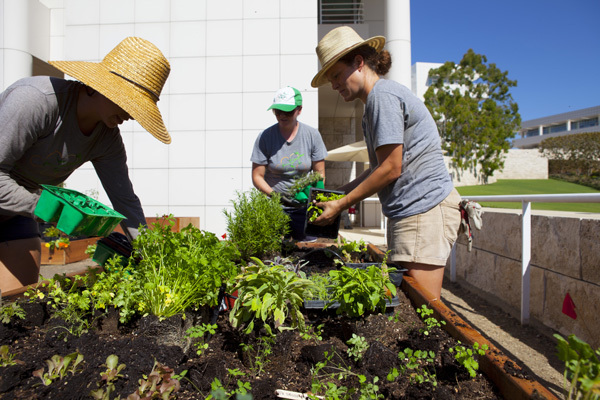 Through student workshops, intermittent public hours, and small gatherings, the Getty Salad Garden explores the unique way gardens inherently foster community, and hopes to inspire new encounters between visitors, artists, gardeners, cooks, museum staff, and works of art. During Julia’s latest salad exploration adventure in Japan, where she sampled dishes with myoga wild ginger flower, ponzu dipped sea grapes, and fried lotus root, Sarah Cooper (Public Programs Specialist, Getty Center) spoke with her about how the Getty Salad Garden came to be and how the simple salad managed to get her vote. I always go back to the Greek salad, because I am fascinated by its staying power—I have never met a contemporary twist on a Greek salad that I preferred. In all creative pursuits, it is important to know when not to innovate but to instead appreciate things just the way they are. This is a trait I appreciate most in art—think of Bruce Nauman or the Fluxus artists. Things don’t have to complicated to be good. This season, Julia Sherman is in residence at the Getty Salad Garden, growing, harvesting, and cooking alongside members of Los Angeles’s artistic community. Through student workshops, intermittent public hours, and small gatherings, the Getty hopes the simple salad will inspire new encounters between visitors, artists, gardeners, cooks, museum staff, and works of art. We’re bringing the Mash-up to the Triad this Friday at the Southeastern Center for Contemporary Art! 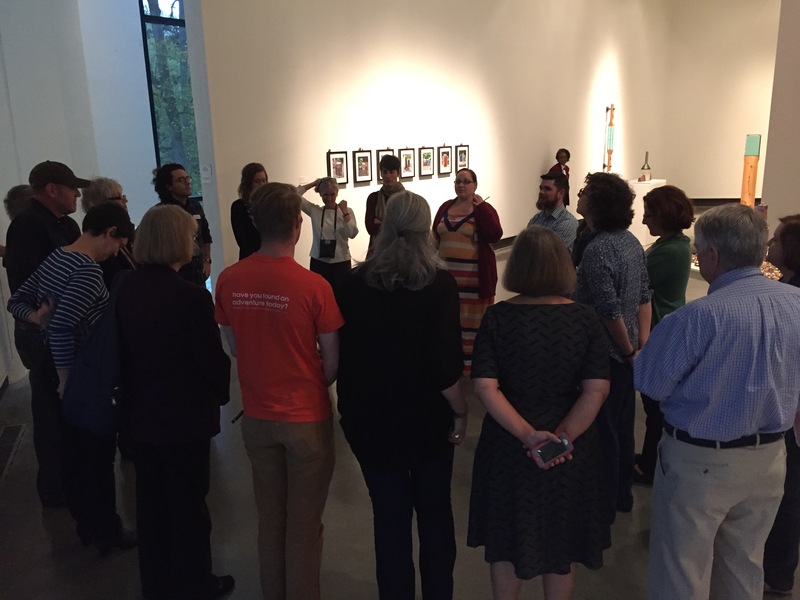 Inspired by the 2014 NAEA Museum Mash-up (which you can read about here and here), we’re going to think outside of our comfort zones and create experiences on the spot with works of art from Point & Counterpoint: NC Arts Council Fellows 2014-2015. Starting at 11:00am, we’ll create small teaching groups, get randomized object assignments and prototype short experiences with these objects. After sharing these adventures, we’ll meet for lunch and discuss the morning. Please invite all experimenters: museum educators, art teachers, science buffs, general educators, as well as any community members interested in playing! The more the merrier, no experience in art necessary, just a can do attitude and willingness to play and experiment. For more information, contact Jen@theengagingeducator.com or RSVP here! By the time the painting was on its way back to its home at the Cleveland Museum of Art earlier this spring, El Greco’s Holy Family with Saint Mary Magdalene and I had spent 320 hours and four months together. As an on the-floor-interpretation assistant for the Portland Art Museum’s Education Department, I was in the gallery with the painting four days a week, interacting with visitors, experimenting with interpretive strategies, and reflecting on this 400-year-old painting. This experience gave me room to experiment with visitor engagement on the gallery floor, changed how I approach the act of looking, and influenced my teaching outside the museum. Masterworks: Portland gallery adjacent to the Portland Art Museum’s European collection galleries. Photo by Mike Murawski. El Greco’s Holy Family with Saint Mary Magdalene came to the Portland Art Museum as a part of the Masterworks: Portland Series. Though I had seen previous works in this series as a museum visitor, I wanted to learn more about how the single painting exhibition model fit into PAM’s approach to visitor engagement. I refreshed myself on the mission of the Portland Art Museum, and of the impetus behind the Masterworks series in particular. A critical facet of the Museum’s mission is “to facilitate dialogue with diverse audiences.” What does this mean, I asked myself? And how does this series, which has brought individual works by Raphael, Titian, Thomas Moran, and Francis Bacon to Portland audiences, achieve this goal? I considered my own role as an educator on the floor with a single artwork and how I might facilitate conversation, without imposing on each viewer’s unique experience. One immediate challenge I faced was learning how to open up the quiet, contemplative space of the special exhibition gallery. Where are these curtains from? What do the wall texts say? What questions to they raise/answer? Why is it so dark in here? And quiet! While certainly not earth shattering, these initial field notes illustrate a potential tension between the goals exhibition design and those of education. The space was so quiet and almost altar-like that visitors would immediately halt their conversations, or speak in low whispers as soon as they entered. I became fixated on how to overcome the elements of the gallery– the layout, the lighting, and the decor – that seemed the antithesis of my job, which was to enliven the space through conversations about art. I struggled with how to approach visitors who, as soon as they entered the gallery, became hushed, or exited the space quickly, as if intruding. Was it okay to interrupt someone who seemed lost in thought, staring at the painting? Did I dare ask what two giggling teens found so funny about the Holy Family? The answer was yes; I just had to locate the confidence in myself that approaching a visitor about her experience in the gallery was not an interruption, but an opening to access the work of art. I learned to use the look and feel of the space to introduce conversations with visitors about how museum design impacts how, and what, we see. I also learned that people can and will say no if they don’t want to be interrupted! 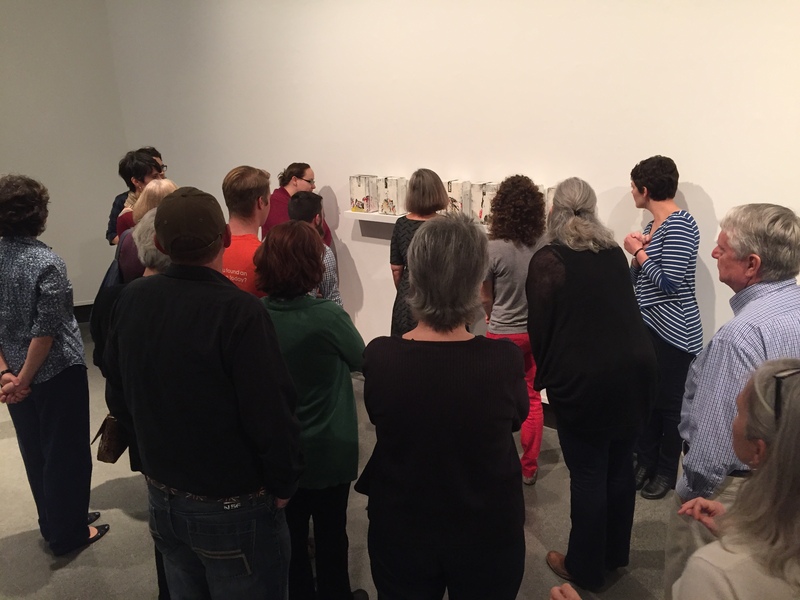 I was inspired by this post by Rebecca Herz on visitor engagement and developed gallery activities that would guide viewers back to the work. Whether you’re a museum educator or teach in the classroom (or do both), you’ve probably engaged in some slow looking exercises with a group. In the classroom I regularly require my art history students to study a single artwork for an hour before writing anything down, but I couldn’t remember the last time I stopped and looked for that long. 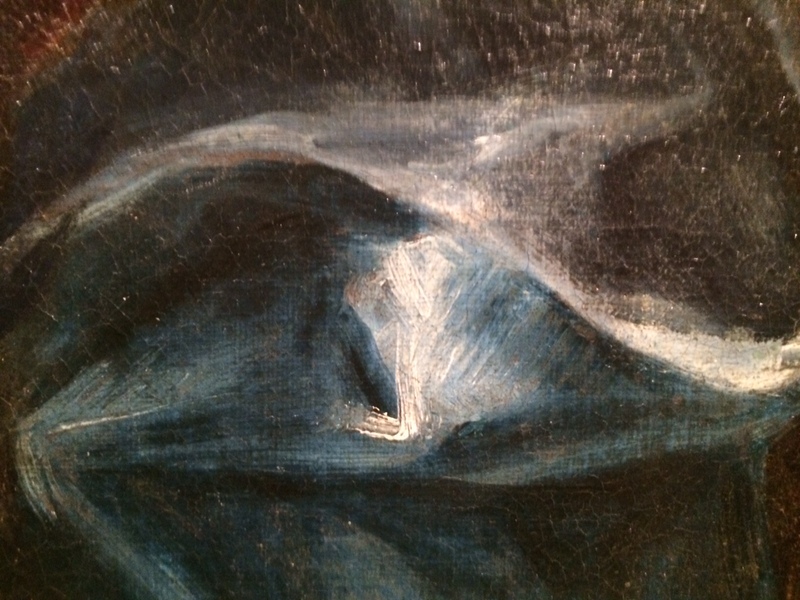 Being in the gallery with the El Greco gave me the chance to challenge myself to the act of looking deeply. detail of El Greco’s Holy Family with Mary Magdalene. What turned out to be most remarkable about this challenge was that I didn’t have to go at it alone; being on the floor with visitors meant that I could look at the painting over and over again through many different lenses, and with a variety of different viewers and viewpoints. Many people came into the gallery and went straight for the painting, ignoring the wall text and just delving into their own interpretation. For these visitors, I became more of sounding board for their thoughts on El Greco’s unusually long forms, strong contrasts, and dynamic sky. They’d ask me questions about the piece, but were largely content to draw their own conclusions. Others would soak up all the information they could before turning to the painting. This included wall texts and conversations about the painting, accessible in the gallery through an app called STQRY. My presence in the gallery began to feel more and more organic, and I had repeat visitors who would come back to chat about the piece, or to share thoughts they’d had while contemplating the work on their own, outside of the museum. 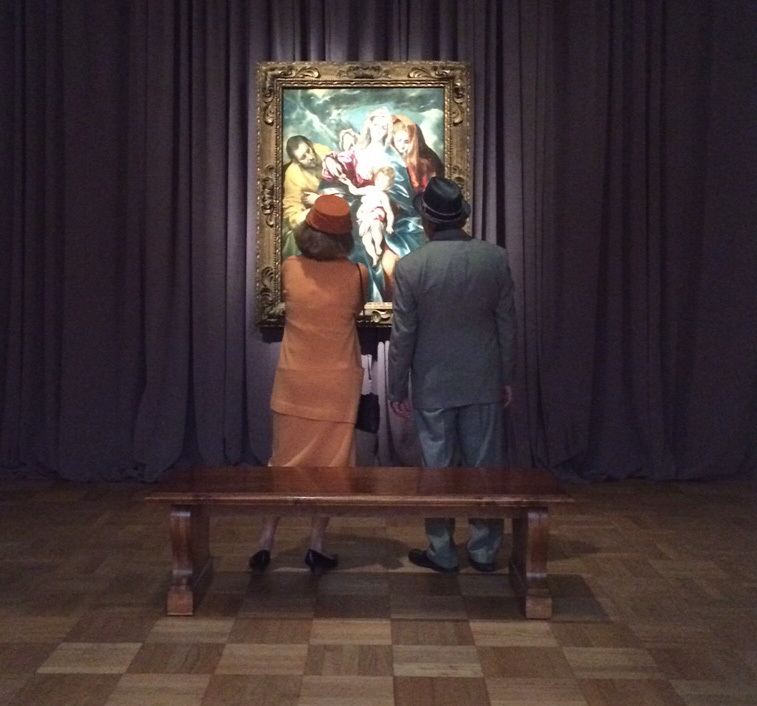 The most rewarding part of this experience was my regular and direct contact with museum visitors. These interactions provided the basis for my interpretation of the painting, influenced the design of my in-gallery activities, and offered direct evidence that my work was having a meaningful impact on visitors’ experiences at the Portland Art Museum. I shared an emotional moment with one man, Ed, a retired graphic designer who had studied painting in New York in the 1950s. 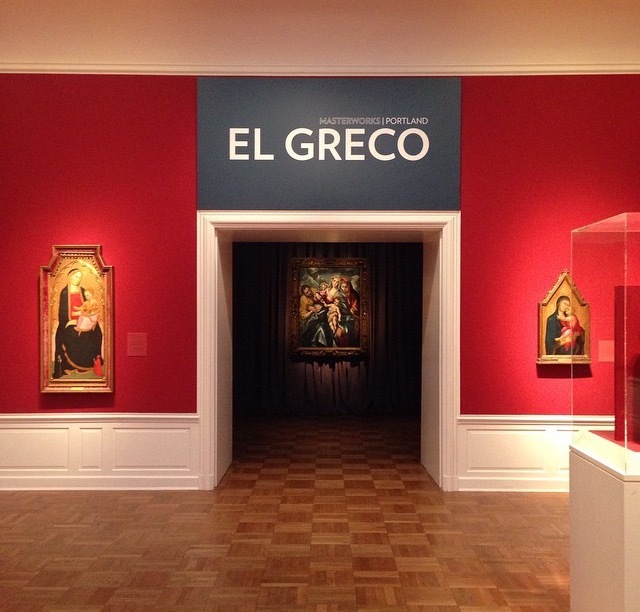 He and I talked not only about the remarkable way El Greco composed his image, but also about Ed’s own struggles as a painter, relating them to El Greco’s desire for patronage, for someone to appreciate, understand, and ultimately fund his work. These are things working artists can relate to, Ed told me, when he revealed that he’d given up painting in his 30s in order to earn a living as a designer. Betty, age 87, approached me in the gallery to share that she had first seen El Greco’s Holy Family in Cleveland when she was 18. She explained to me the impact the work had on her, even after all these years. We bonded over the tired, but so human-looking Mary, and Betty told me that over the course of her life – ending a marriage, raising three kids, struggling and finally succeeding professionally – this painting, particularly Mary, had stayed with her. I think an interpretive guide with the painting gave people permission to talk about what they were seeing, feeling and experiencing as a result of looking at work of art. I believe these conversations shifted visitors’ expectations of a museum experience, and they certainly changed my approach to looking at and teaching about art. Spending so much time with one work forced me to really study and appreciate all the work El Greco was making paint do. In the gallery, I had the opportunity to talk with many people, including painters, sculptors, and writers about what they saw when they looked at the surface of the painting. We’d notice those trademark El Greco highlights, but also bits of underpainting, a rawness that pointed to process; in these discoveries the mechanics of painting became accessible and the 400 year old surface was fresh again. These interactions inspired me to create more opportunities for creative writing and art-making in my art history classroom. Chatting with a sculptor in the El Greco gallery about form and movement, led me to experiment with an in-class activity where my students recreated 2D works in 3D with found materials. This activity initiated self-directed discussions among small groups of students about form, process and material, and allowed us to return to the work invigorated. Ultimately, I learned that facilitating visitor engagement can be as low tech as having a conversation. 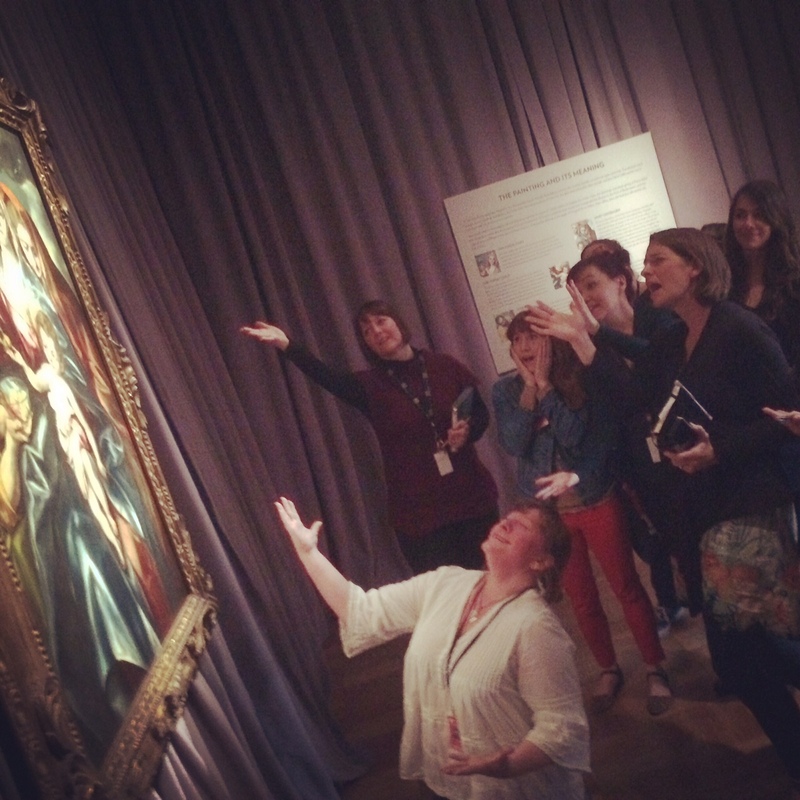 Portland Art Museum’s Education team saying a dramatic goodbye to El Greco on its last day on view. Photo by Mike Murawski. KELSEY FERRERIA teaches Art History, Architecture, and Design at Portland Community College. She also works with the Portland Art Museum as an Interpretation Assistant where she’s developed mobile and in-gallery learning experiences for the Museum’s special exhibitions. Both in the classroom and in the gallery, Kelsey loves experimenting with different learning strategies, and aims to facilitate meaningful experiences with works of art. She holds a BA in Art History from Willamette University and an MA in Art History from the University of Oregon.